Home Costs > How Much Does a Can of Spray Paint Cost? How Much Does a Can of Spray Paint Cost? Spray paint is an easy-to-use coating paint that is available in different shades, textures, and purposes and is commonly usually used to coat wood, metal, concrete, and plastic surfaces. How much does spray paint cost? 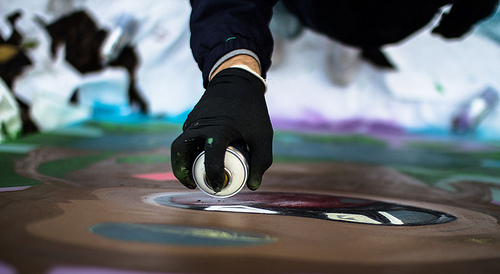 On average, a can of spray paint is going to be anywhere from $1 to $8 per can. The cost of spray paint is going to come down to the brand, purpose, sheen, volume, and color. A can of chrome spray paint, for instance, be about $8 per can, whereas a metallic spray will be less than $4 at most major retailers. At the Home Depot, for example, spray paint can cost anywhere from $4 to $15. They offer a variety of spray paints from all surface, automotive spray paint, general purpose, primers, rust preventive, specialty and decor. Walmart, on its official website, has just about every color and sheen option available, with prices ranging from $1.50 to $5 per can. The most popular brand on the market, Rust-Oleum, retailed for about $3.50 per 12-ounce can. According to this helpful AllThingsThrifty.com post, she spent about $3.47 at her local Walmart and advised against purchasing at a local craft store since the prices were so much higher. Some spray paints may include certain accessories, like a straw, to help painters coat tiny holes or corners. There may also be different tips given that allow the user to spray in different strokes and styles. Spray paint will usually come in a 10, 12 or 16-ounce cans. Like paint in a can, spray paints can come in virtually every color imaginable. Popular colors and schemes can be seen on this Rustoleum.com “working with color” page. Sheens can include flat, gloss, matte, satin, semi-gloss and high gloss. Popular brands found at most retailers will include Rust-Oleum, Valspar and Krylon. Before you paint your desired object or an area of an object, you will need to cover the area to prevent getting paint on other items you are not painting. This may include floor covering and/or painter’s tape. You need to also consider a paint thinner to erase all traces of paints from your hands. Paint thinner is also useful when an unexpected mistake has occurred. While optional, an aerosol spray gun can help make the job easier. An aerosol gun can start at $4 to $10 and can help you cover the object evenly. Specialty paints, such as a metallic color, may cost more than the average can of spray paint. Try to identify what kind of an object you are about to coat. The material you are painting and the desired texture and finish will determine the type of paint you need. Follow the instructions written on the back of the spray paint can. Adhering to proper painting strokes gives you the best results. Gently remove the tape when the paint is already dry to avoid scratching some parts of the painted area. Coat the object three times; this is the basic rule when it comes to spray paint. Spray paint can potentially damage the object being painted. Test the paint on a small piece of the object first to make sure there are no adverse effects. When using spray paint, it is best to do it outside to avoid exposure to the chemicals. If doing it outside is not possible, you should do it in an open room that provides air circulation, and should also wear a protective mask so you do not breathe in the fumes. The size of the area which can be covered by one can of spray paint can vary from 18 to 25 square feet. This will be determined by a few things. First, the color of the item you are painting compared to the color of the spray paint. A light colored paint being used on a dark colored item will require extra coats. Another factor is the material that you are painting since different materials respond differently to spray paint. Finally, the quality of the spray paint may determine the area that can be covered. Depending on the surface and the type of paint you’re using, it can take up to 10 minutes for spray paint to dry before you either apply another coat or touch the item. Instead of buying junk newspapers, consider using neglected document papers or old newspapers available at home. This will help you save money when it comes to a small makeshift tarp. Try to visit paint stores in your local area and differentiate the prices. Not all paint stores offer the same price on a specific brand. If you do not have time to visit a store, compare the prices online. All stores will vary with their pricing. Don’t be cheap with your spray paint as the cheaper dollar cans may require more than a few coats when compared to a higher quality. Dollar store spray paint cans are often ideal for those who are doing stencils.